Cornish & Co., Washington, N.J.
July 17, 2001: Pump Organ, donated by Florence J. White of Valencia. Brought down from Oregon. 16 stops, probably 1880s. 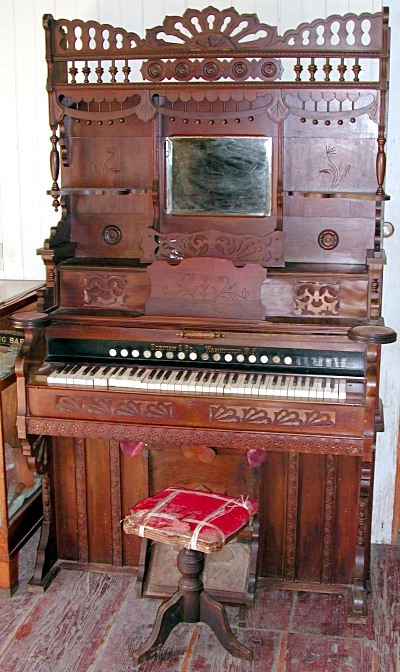 Organ stands approximately 7 feet tall, with bureau. Without bureau, main part of organ measures 49" x 49" x 24". Manufactured by Cornish & Co. of Washington, N.J.
Donation includes stool with horsehair cover.